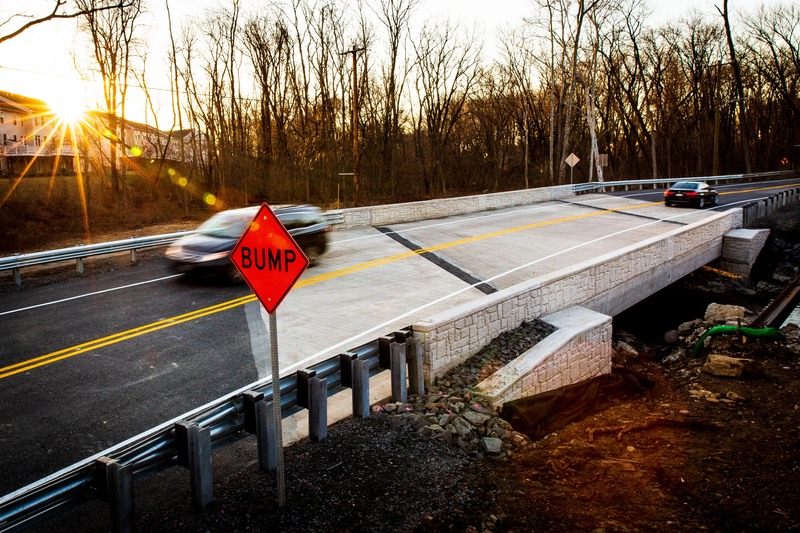 King of Prussia, PA – The new bridge carrying Pennsylvania Avenue (Route 2027) over Sandy Run in Springfield Township, Montgomery County, reopened to traffic today. This bridge was replaced as part of the Pennsylvania Department of Transportation's (PennDOT) Rapid Bridge Replacement Project. The polyester material can only be applied when temperatures are consistently above 40 degrees, dry weather is forecasted and after the bridge concrete has cured for at least 30 days. An alternating traffic pattern controlled by flaggers will be used to maintain traffic through the project area when the PPC overlay and final paving is applied in spring 2019. The Pennsylvania Avenue bridge averages over 12,800 daily vehicles. The new single-span box beam bridge is longer and wider than the single-span concrete, T-beam bridge it replaced and is designed with a 100-year lifespan. This bridge is referred to as JV-217 and is one out of the 558 bridges being replaced under the Rapid Bridge Replacement Project. JV references the joint-venture partnership between Walsh/Granite, which is leading construction for the entire project. Replacement work for this bridge was performed by Walsh Construction II of Chicago, IL.